Stop by this stylish SoMa eatery for the short rib poutine: Parmesan truffle fries create a nest for a mound of shredded beef that’s smothered in short rib jus. For a couple hundred extra calories (and two bucks), add a side of foie gras mayo. 3941 Main St., 604-872-3663. Poutine can be (sort of) good for you: This Commercial Drive canteen’s Veggie Delight comes with eggplant, mushrooms, onions, red peppers and tomatoes atop local potatoes and vegetarian gravy. 1885 Commercial Dr., 604-253-4220. The Belgian owners of this chic Crosstown hangout offer their own twist on our national dish with “Poutine à la Belge.” Thick fries are topped with blue cheese and pink peppercorns before being dressed with cilantro, gravy and a balsamic reduction. 562 Beatty St., 604-879-7119. 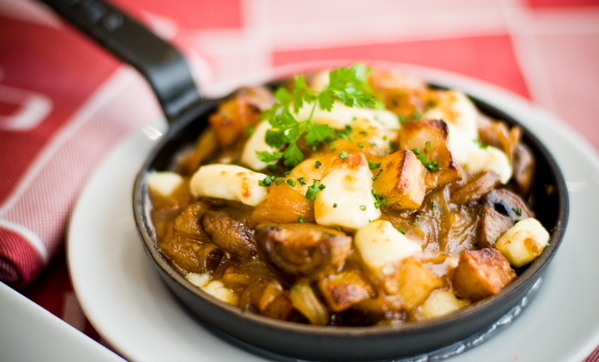 The duck poutine lyonnaise at Kitsilano’s fave French bistro offers a meal-worthy haute cuisine take. Lyonnaise potatoes are topped with mushrooms and onions, shredded duck confit, cheese curds, duck jus – and a sunny side up egg. (Pictured above.) 2563 West Broadway, 604-739-7115. Fritz keeps it real with traditional poutine served until late in grease-spotted paper bags. The cheese is squeaky, the gravy is flavourful and the fries are thick. 718 Davie St., 604-684-0811.